← I like Riding Because….And I Thank My Dad For It. 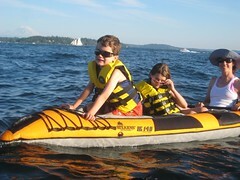 Summer in Seattle is in full swing. We’re taking advantage of a streak of near perfect weather by drinking a few of Tim’s Mojitos , swimming and kayaking in the lake, enjoying backyard BBQs, visits with out-of-town friends, staying up late, reading lots of books and neglecting our blog. Here are a few photos of our summer adventures so far. I hope you’re enjoying your summer too! 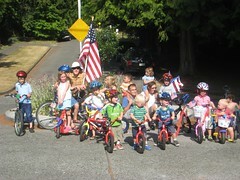 This entry was posted in extravehicular activities, neighborhoods, summer and tagged carfreedays, seattle, summer. Bookmark the permalink. 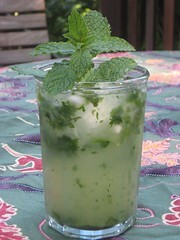 Must find a way to integrate Tim’s mojitos and Kidical Mass. If the beerfest collabo works out next month, on to harder stuff? Julian, Mojitos and Kidical seems like the perfect fit, we could probably make that happen. 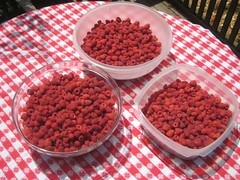 look at those delicious raspberries! I envy you, ‘cuz I get mine at the farmers’s market. Marge, if you have a yard I can give you some raspberry canes. They multiply like crazy!